I briefly owned the blog named Xialanxue when the owner gave it up for yet to be disclosed reason. Xialanxue is immensely popular lately due to the affair that involves a Nanyang Polytechnics (NYP) girl Tammy, whose the video of her sexual moments with her boyfriend recorded on the girl’s mobile phone by themselves, been allegedly stolen and released to the public. Xialanxue was among the first to broke the news. So it’s to my surprise that suddenly the blog returned 404 error, which mean the blog was no longer available (had been deleted), or there was no post been posted at all at http://xialanxue.blogspot.com. I tried anyway, to create at blog via Blogger.com at xialanxue.blogspot.com, and guess what? It went through, and I owned xialanxue.blogspot.com with PageRank 4, with any hack or crack! Anyway, Xialanxue finally contacted me to claim back her URL. 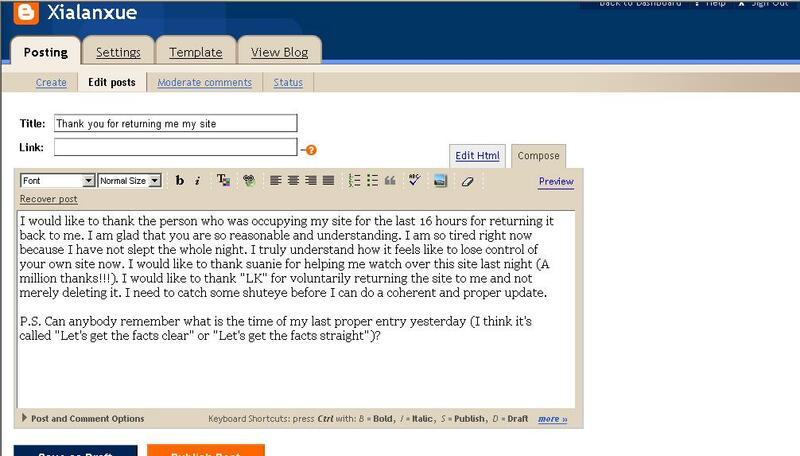 I decided to give back the blog to her as it’s her hard work that builds up the blog and its readerships. 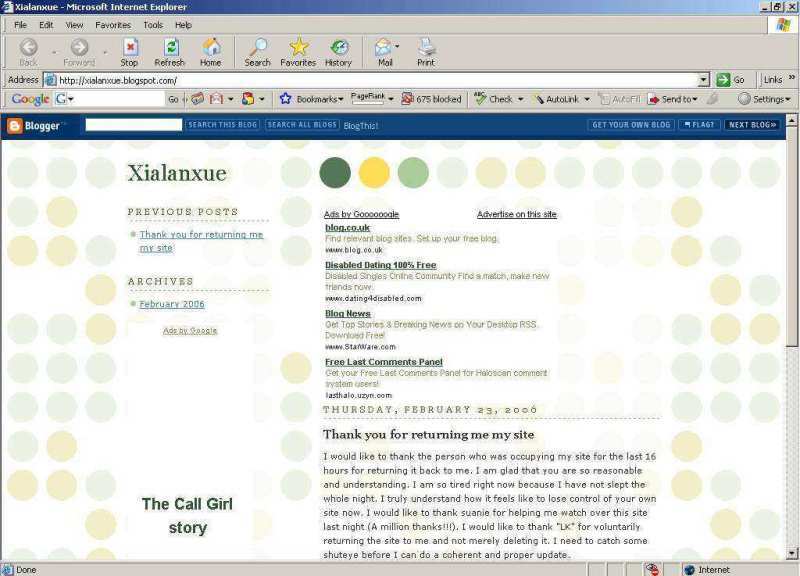 I thought of just delete the blog, but at her suggestion, I added her account as an admin of xialanxue.blogspot.com, and then she deleted me away. The problem was, after a while, at the same browser window, I found out that I was still able to access the Xialanxue blog as admin! May be it’s due to cookies that is still reside in the computer, and it might be some security hole concern, although I doubt many will encounter situation like this. I tried to access the Posting area, and I was able to view and edit what Xialanxue has just wrote. Notice also the different title of the blog, the remained at “Xialanxue” which set by me, instead of “I have reclaimed my site. Currently in the process of updating”, which was set by Xialanxue. I tried to make a modification to the Xialanxue’s entry, by enabling the comment. And it worked. The only problem was that Blogger not only allowed me (an already deleted user from the XLX blog) to edit and post, it even used the old template that I previously used, even though xialanxue already changed it to her favorite: Minima Black. Template that I used on xialanxue.blogspot.com. Blogger reverted to this template after I made the changes to the post posted by XLX, even though I no longer a valid user. Later I tried to add me in again as a team member of XLX blog. Well, invitation email sent to me, and once I clicked it, voila…. I am the member of the Xialanxue blog again now. Open invitation after I added my email. I am once again member of Xialanxue. I am not sure if it’s a security hole in Blogger, or it’s just a feature of using cookie. The workaround is the member removed himself/herself. I clicked on Remove myself, and the magic won’t repeat anymore.